We can do any kind of chimney! Your chimney has a big responsibility. It carries toxic gas out of your home, and while doing its job, it must withstand constant attack by acid, creosote and extreme temperatures for years on end. These conditions cause chimney damage and deterioration, and when that happens, your family's safety is in question. becoming house fires, venting is a serious responsibility. Look at the picture on the left. Most people would not see anything wrong with this chimney. But there is more to the story. On the inside, the chimney could be seriously damaged, and not be up to safety regulations. Old-fashioned chimneys were not designed to vent modern heating appliances. Besides, no chimney lasts forever. Because of the hostile environment, the inside of both flues of this chimney have deteroirated. Notice the cracked flue tiles (left) and the deteriorated joins and/or misaligned flues (right). According to code, both flues should be relined. 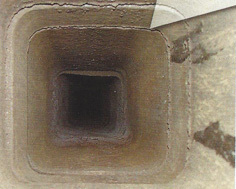 High-efficiency furnaces do not waste energy by sending heat up a chimney. As a result, temperatures in the flue drop low enough to produce condensation. This water combines with acids in the flue to create acidic moisture. Clay liners are particularly vulnerable to this acidic moisture assault. Carbon monoxide (CO) is a colorles, oderless gas. Sometimes an early warning is flu-like symptoms, but CO can cause brain damage and death with no warning. A damaged furnace flue poses a real threat of carbon monoxide poisoning, because this gas can escape through the smallest crack. Also, a partial or complete collapse of the clay flue liner can block the flue, and quickly fill the house with deadly gas. Sadly this tragedy occurs in homes across the country every year. This flue is servicing a fireplace, wood stove, pellet stove or other solid fuel appliance. It may have undergone a chimney fire, or have been connected to an improperly vented appliance, misused wood stove, or exposed to excessive moisture. A damaged flue brings the dangers of fire and carbon monoxide poisoning. Chimney fires happen when creosote builds up in the flue and ignites. These fires can rage at temperatures up to 2000 degrees and roar just inches away from your home. The intense heat alone can bring surrounding materials to the flash point, and ignite your home. Also, sparks from the fire can find their way through small cracks in the liner and quickly turn a chimney fire into a house fire. 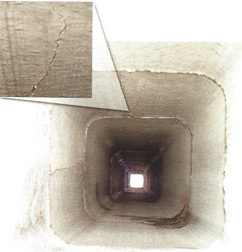 Rhino Rigid™ is the premium solution for the problems that plague most chimneys. Modern stainless steel walls provide an airtight and watertight barrier that seals in acidic gases and creosote. Rhino Rigid™ is especially suited for applications that require a smooth inner surface liner. The smooth wall construction of Rhino Rigid™ permits 15-20% better flow of vented gases due to its reduced turbulence as compared to standard, corrugated chimney liners. In addition, the heavy 24 gauge thick stainless steel wall design is well suited to handle repeated cleanings year after year. This is one tough chimney linger - Rhino tough! The Rhino Rigid chimney liner is made from 100% prime 304L, 316L or AL29-4C stainless steel. The stainless steel alloy used in your installation will be dependent on your type of heating appliance and its efficiency rating. 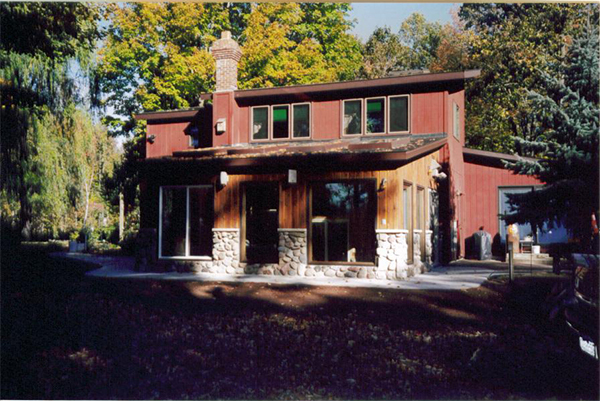 Your installation professional will discuss these options with you. These modern stainless steel aloys are made to withstand the acidic moisture and extreme temperature fluctuations inside your chimney. Rhino Rigid™ will even contain a chimney fire! Rhino Rigid™, and all EverGuard® liners , carry the exclusive Forever Warranty™, the first warranty in the business that is transferrable to the next homeowner. No fine print in this warranty, just peace of mind.